Bike advocates and city workers marked the opening of two bike-share stations by Union Station this morning. The newest station is on the redesigned Wynkoop Street, and the other is behind the Union Station facade on a pavilion near Wewatta Street. Together, the two stations add 35 docking points to the system, with B-Cycle adding 18 bikes as well. 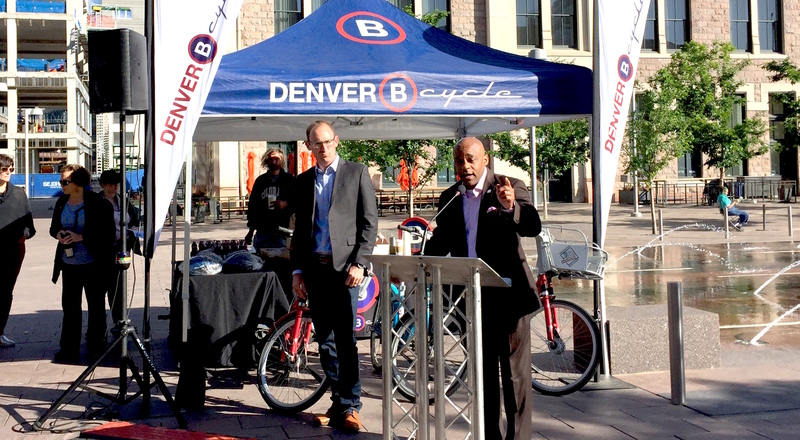 “With the city’s help of getting this on-street station in front of [Union Station], we really feel like we’ve been ingrained, we’ve been embraced, in the transportation culture here in Denver as a first-and-last mile connector,” said B-Cycle Executive Director Nick Bohnenkamp. Even if you limit the discussion to just bike-share, Hancock could do a lot to give Denver residents more mobility choices. With 87 stations and 719 bikes, B-Cycle is currently too small to serve most of the city, and it’s especially scarce in low-income neighborhoods. The system has to grow exponentially to make bike-share a viable transportation option citywide. San Francisco covers less than a third the area Denver does, but its bike-share system will have 4,500 bikes by next year. The network will cover most of the city with stations that are all a short walk from each other, which is the basic recipe for a useful bike-share system. Denver City Council members say they want to expand B-Cycle citywide, but have yet to deliver a plan of action. B-cycle is seriously lacking for residents that live outside the 16th Street Mall. It seems geared to someone that arrives in downtown Denver without a car than the every day needs of Denver citizens. I don’t think that the city provides any funding to bcycle at all. A full build out and maintenance would still probably be less than th I-70 debacle, though. San Francisco is 27% larger in terms of population but almost three times as dense. Plus, their transit coverage is far superior. Bike share systems and good transit coverage go hand in had. Improve the transit situation, encourage in-and near-neighborhood destinations and bike sharing becomes more sustainable citywide.